Variants and Fan Cards / Re: Pile Control Card --Reinforcements? “Less than this” in the top half referring to the card itself is super confusing, it definitely sounds like it’s talking about the card being trashed. I would definitely say “costing up to $5” instead, otherwise it sounds like it’s a card that lets you trash a Colony from the supply to gain two Provinces. “Less than this” in the on gain ability is fine as there’s no other subject to confuse it with. It is! Otherwise it would be totally insane. Still, you might be right about its strength....another useful comparison might be Altar? Dominion General Discussion / Logical Dominion translation? How difficult would it be to translate the functions of Dominion, and all its cards, into a logically-precise language, à la Frege or Russell? Variants and Fan Cards / Pile Control Card --Reinforcements? Trash a card from the supply. Gain up to two cards, each costing less than this. When you gain this, each other player may gain a card costing less than this. 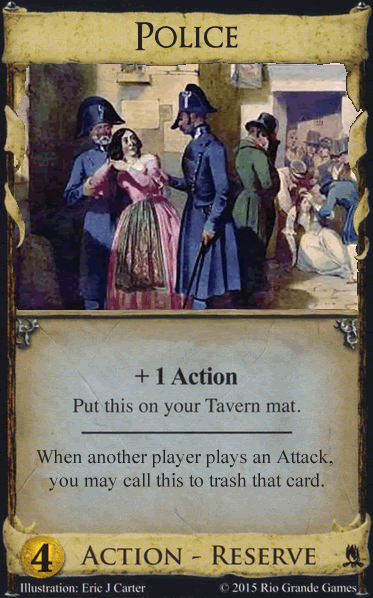 Obviously a card that would be useful the whole game, but in particular the end--trash a province, gain two duchies while you're ahead; etc. Goko Dominion Online / Weird Problem W/ Mac OS X Yosemite? So, whenever I open Dominion, after I quit it, the dock is completely gone, and there's no way to get it back. I have to restart the computer. (In fact, not even minimizing a window works--it just freezes and then goes back to staying open). Uh, pretty sure that should be socially awesome penguin all the way down. General Discussion / Re: Movies: Any movie buffs? Anyone who has Studio Ghibli's last movie playing in their city, I highly recommend. Sorry sir, you've made a thematically sensible dominion card. I'm afraid I have to revoke your dominion license. Give this kingdom to Marin, and see if he's able to resist buying Throne Room anyway. I cringe every time he dumps every single card out onto the floor. I start the buy phase with no cards in hand. I finish it with some cards in hand. How did I do it? Using coins accumulated earlier, you buy a Bonfire, trashing a Cultist, Rats, or Fortress in play. Yep, this is what I was thinking. I'm not sure if there are other ways to do it. Actually, this only draws you one card, but I feel there must be something like it to get more. Man, looking at these things, I feel like the whole point of this expansion was just a way for Donald to get the Rules Questions section flowing again….. So, with mission, I could still activate another event on my second turn? I agree with "The Lego Movie"....but then, I think "Princess Kaguya" should win Best Animated Feature even with Lego in the running. You could just do it at Wandering Winder's place, cuz, you know, he's everyone. And only adds to my excitement. I'm gonna end it, so hurray!